It is by now fairly widely thought that the Best Picture and Best Director races for the Oscars this Sunday are down to two films: Richard Linklater's Boyhood and Alejandro González Iñárritu's Birdman. Both films have their champions. Both films are ambitious. Both films are dominated, in the popular consciousness by the presence of an all-encompassing gimmick each film built its narrative around. Having spoken briefly about my ambivalence towards Birdman but never really explained my position, I thought I'd talk for a minute about why I think its gimmick doesn't work, and I think Boyhood's does. There have been hundreds of movies that spanned a large portion of a character's life without being filmed over the course of a decade. Consequently, there are a dozen workarounds that have been developed. From simply recasting the part after a time-jump to old age make-up, there are plenty of ways to convey that a character has aged. But they all require you to take a step back outside the film, to transfer your loyalty between these two or three different actors who you know are different people and consciously say, "No, they are the same." It removes you, even for a moment, from the world of the movie. They are fake. They are talented, practiced, affecting fakes, but you know, on a basic level, that it's a cheat. By filming Boyhood over the course of its cast's life, Linklater bypassed that bit of cognitive dissonance, and let the empathy continue to build. He wasn't telling an epic, though. He wasn't telling the grand, sweeping story of a generation. He was telling a quiet, slice-of-life story. He was operating in the mode of Before Sunrise, light on incident that's mostly contrived anyway, but heavy on the internal lives of its leads. There wasn't anything fake about the cast, though, and that let you feel for them, strongly and without reservation, throughout the film. Linklater could skip many of the obvious hallmarks of teen life - the first kiss, the first beer, etc... - because we could see that these characters had lives and experiences off the screen, that there were entire worlds taking place between scenes. Saying that, "Without the twelve year gimmick, nobody would be talking about Boyhood," is beside the point; the gimmick is the movie. Swap actors in and out, and you lose the quiet intimacy that is Boyhood's powerful emotional engine. If you believe, as Roger Ebert once memorably said, that "the movies are like a machine that generates empathy," a way to viscerally put yourself in the shoes of another human being, on the soil of another world, then you understand the power of Boyhood's gimmick. Movies made to look as though done in a single take are also not new. Most notably, Alfred Hitchcock tried it with 1948 thriller <i>Rope</i>, which used the gimmick as a way to raise and sustain tension. In the movie, a pair of young men murder someone, at least in part because of how taken they are with their favorite teacher's philosophy of the 'superior man'. They then host a dinner party while the body remains hidden in the apartment, confident in their superiority even as their lies fall to pieces around them. The long take ensures that you always know where the body is in relation to everyone else at the party, while promising that Hitchcock can't get away with editing trickery to move it. The single-take thing didn't work terribly well for Hitchcock, but there was at least a reason for it. Birdman has no such defense. Is it because of Riggan's inability to sleep? It'd be excellent if so, but then, why does it continue to do so even when we aren't anywhere near Riggan or his point-of-view, or after he finally does sleep? Is it because of how hectic life is backstage? Plausible, except, again, it continues outside the theater, on the stage, changing from character to character, sleeping, anything. Everything you might come up with as an explanation for why the long take style was used, every narrative or tonal defense, is defused by a movie that simply doesn't call for it, by a script that can't stick to one idea for more than a couple minutes at a time. Is the single-take gimmick impressive? Absolutely. Does it contribute anything meaningful to the story, the characters, or the film itself? Not a thing. 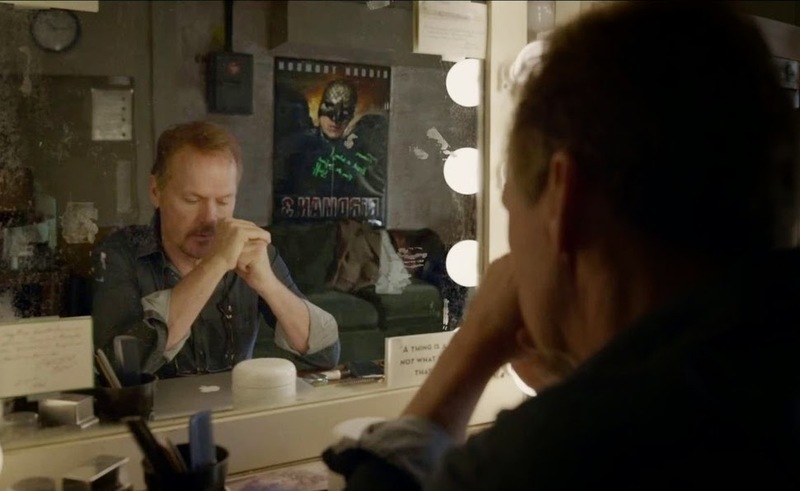 In many ways, it feels like the battle between the gimmicks of Boyhood and Birdman boils down to your beliefs about film. Should it be about the flashiest possible technical skills, regardless of how those skills are used? Or should it be about storytelling, first and foremost? Is film - are stories - about empathy or spectacle? We'll all fall in different places on this spectrum, but to me, it's difficult to separate Birdman from something like James Cameron's Avatar, another wildly-loved technical marvel that has aged... let's be polite and call it 'poorly'. Technical marvels age poorly; stories don't really age at all. Every decision, from the use of color to the sound to visual effects and beyond, should be in service of the story, should tell us something. In Boyhood, Linklater found a daring way to tell a story spanning over a decade without the dissonance found in swapping actors. The 12 year thing is a gimmick, but it's a necessary gimmick for him to tell the story he wanted to tell. You could add edits to Birdman almost at random and lose nothing; it's flash for the sake of flash... or, more specifically, flash for the sake of awards. Boyhood has plenty of problems, and it is not my pick for the year's best film. Indeed, it barely made it into my Top 5. But Boyhood is affecting, smartly constructed, well-characterized, and, not to get too repetitive, deeply, passionately empathetic. A win for Boyhood is a win for storytelling, for maturity, for subtlety. Or, hell, given how these Academy voters seem to be interacting with film, it's probably just a win for a different kind of gimmick. But at least it's a gimmick well-used.